Miss Prue Minter,daughter of Pleas and Leah (Greenwood) Minter, was born at Pine Forest, Hopkins County, Texas, 21 December 1900. 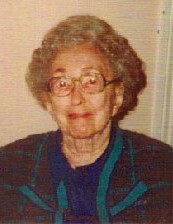 She is the eldest living person of the John Morgan descendancy, being in her 99th year. Prue lives in Houston, Harris County, Texas, in a luxury managed care apartment hotel. She is in relatively good health, with the exception of having an eyesight problem which has lasted several years, and culminated in blindness in recent years. She has a nurse now to aid her at all times. Prue is completely lucid even to this date. Our late cousin, Marlin P. J. Minter, Professor Emeritus of Electrical Engineering at Texas Technological University, who was her first cousin, once said that Prue is a mathematical genius. Prue, with her family, moved to Madill, Oklahoma, when she was a small child, and that is where she attended public school. Later, the family moved back to Hopkins County, Texas, to the town of Como. Prue went to stay in the home of her aunt, Margie, wife of Dr. Guy Z. Minter, and attended Kid Key College, at Denton, Texas, for two years. Finishing there, she then went to East Texas State teachers College, at Commerce, Texas, where she graduated and received her degree in Education. She then taught in the public schools at Sulphur Springs, Texas. Prue came to Houston about 1923 to work for Great Southern Life Insurance Company. Her Uncle, E. P. "Pat' Greenwood, had organized Wichita Southern Life Insurance Company at Wichita Falls, Texas, and he was the chief executive officer. Subsequently, Wichita Southern was merged with Great Southern of Houston, and Greenwood, then, became President and CEO of Great Southern. Prue, early on, worked in various departments of the insurance business, and gained a good overall knowledge of the business. With her mathematical talents, it was natural for her to end up as an actuary, reinsurance, and, then, policy loan specialist. She retired from the Company at age 60. The fact, however, that she retired, did not mean Prue had quit business. she plunged into real estate brokerage, and investment field. She has been actively following the gyrations of the stock markets . . . even up to the present time, and has picked some good ones! Through the years Prue's hobby and great interest has been tournament bridge. She holds the title of life master.